This one-day activity will provide an update on a wide range of topics of interest to the practicing gastroenterologist, surgeon and family physician internist. Rapid advances are being made in the understanding of the pathophysiology, natural history and treatment of diseases of the digestive tract and liver. This course will offer practitioners a comprehensive overview of recent, cutting-edge advancements in gastroenterology and hepatology. A special emphasis will be on emerging therapies and concepts that will inform our practice in the future. 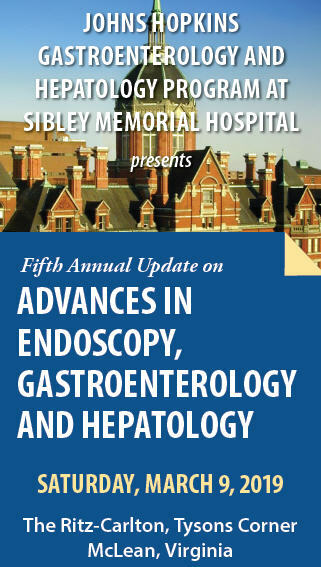 Particular areas of focus will be advanced endoscopic techniques, GI neoplasms, pancreatico-biliary pathology, liver diseases, hepatobiliary malignancies and liver transplantation. This activity is intended for gastroenterologists, general surgeons, family physicians, internists, endoscopy nurses, technicians and physicians interested in GI/Liver disease. A $50 late fee applies to registrations received after 5:00 p.m. ET on March 3, 2019. A handling fee of $50 will be deducted for cancellation. An additional fee may apply for cancellation of other events, including workshops and social activities. Refund requests must be received by fax or mail by March 3, 3019. No refunds will be made thereafter. Transfer of registration to another Johns Hopkins activity in lieu of cancellation is not possible. Discuss recently updated guidelines referencing periendoscopic use of anticoagulants. Employ endoscopy in the management of post-bariatric surgery complications. Apply evidence-based data to the treatment of acute pancreatitis. Describe the role of submucosal endoscopy in the treatment of GI motility disorders. Develop a practical approach to the evaluation of patients with suspected genetic and fatty liver disease. The Johns Hopkins University School of Medicine designates this live activity for a maximum of 7.75 AMA PRA Category 1 Credits™. Physicians should claim only the credit commensurate with the extent of their participation in the activity. American Nurses Credentialing Center accepts AMA PRA Category 1 Credit™ from organizations accredited by the ACCME. American Academy of Physician Assistants (AAPA) accepts certificates of participation for educational activities certified for 1 AMA PRA Category Credit™ from organizations accredited by ACCME. Physician Assistants may receive a maximum of 7.75 AAPA Category 1 CME credit for completing this program. The Johns Hopkins University has approved this activity for 7.75 contact hours for non-physicians. Successful completion of this CME activity, which includes participation in the evaluation component, enables the participant to earn up to 7.75 MOC points in the American Board of Internal Medicine’s (ABIM) Maintenance of Certification (MOC) program. Participants will earn MOC points equivalent to the amount of CME credits claimed for the activity. It is the CME activity provider’s responsibility to submit participant completion information to ACCME for the purpose of granting ABIM MOC credit. A limited number of hotel rooms have been retained for the conference at The Ritz-Carlton, Tysons Corner. Located in McLean, one of Northern Virginia's most desirable neighborhoods, the hotel is connected to high-end shopping at Tysons Galleria, and is a short distance from the iconic landmarks of downtown Washington, D.C.
Click here to book your group rate hotel room or call the hotel at 800.241.3333 and let them know you are with the Johns Hopkins Conference to receive the special group rate of $159 single or double occupancy, plus tax per night. Overnight and daily valet parking, and self-parking are available for an additional fee. Check-in time: 3:00 pm Check-out time: 12:00 pm. Helicobacter Pylori - What's New?